Thank you Barleans for sponsoring today’s recipe! As always, all opinions are my own. 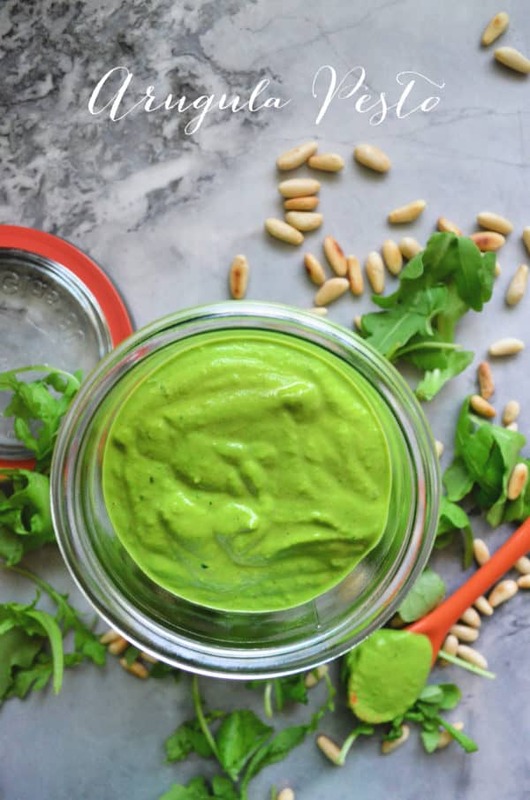 Change up your pesto game with this fast, and fresh recipe for peppery arugula pesto! With just a few simple ingredients you’ll have a delicious pesto. Nothing screams spring more then pesto in my book. Since, Wednesday marked the official first day of spring I felt a pesto recipe was the best way to celebrate! I love to make basil pesto when I have an abundance of it. However, as of lately, I’ve been eating a lot of arugula. With my latest food obsession has come some thoughts on making an Arugula Pesto. Since making this peppery pesto I’ve been hooked. Instead, of adding basil like you would use for basil pesto I used a handful of fresh Italian flat-leaf parsley leaves along with the arugula. It yields the brightest green color! 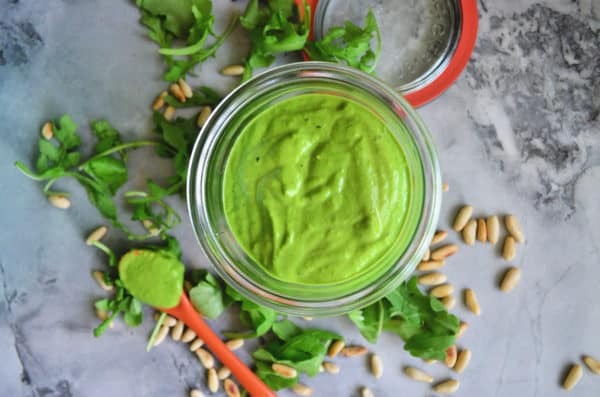 How do you make arugula pesto? First, you will toast your pine nuts. This is the key to making any pesto. I love to stick with the traditional pine nut. However, you could use another milder nut like a cashew for this recipe. Once the pine nuts are toasted then it’s time to blend the pesto. You can use either a high-power blender or a food processor. 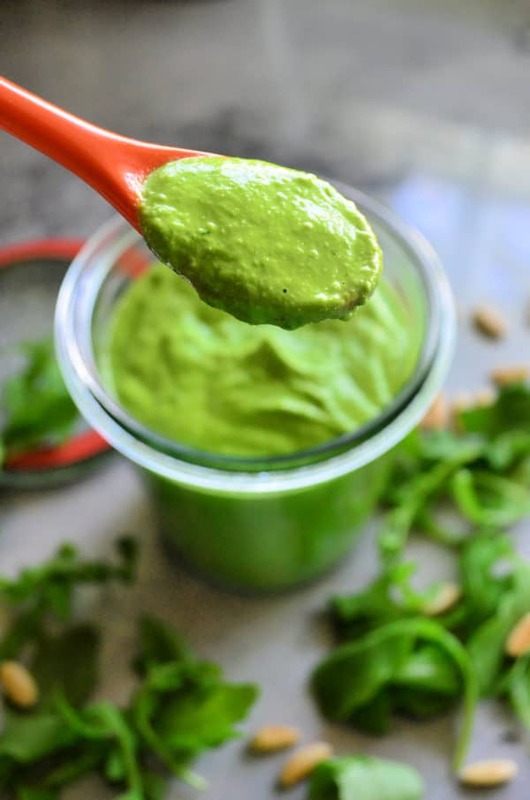 What herbs do you add to arugula pesto? For my arugula pesto recipe I added fresh flat-leaf Italian parsley. However, you could definitely use fresh basil (like a traditional pesto) or even cilantro. Of course, that will completely change the flavors of the arugula pesto. Personally, I think the way the flat-leaf Italian parsley compliments the peppery arugula best. Give it a whirl, and try with whatever you have on hand! How can you use pesto? Pesto is extremely versatile and can really enhance the flavor to any meal. Here are a few of my favorite ways to use pesto. 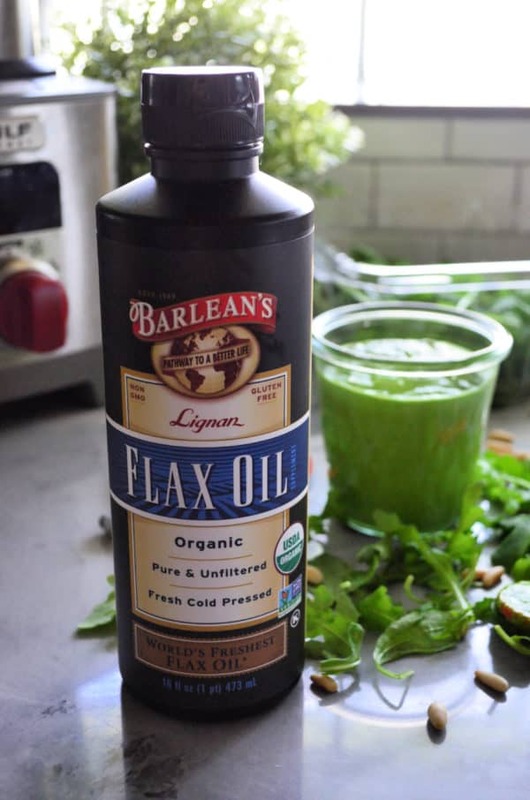 Flax Oil – the super secret ingredient! You would never know if I didn’t tell you that this pesto contains Barlean’s Lignan Organic Flax Oil in combination with olive oil and some water. It adds additional nutrients to the recipe without anyone ever suspecting!! What is Organic Flax Oil you might be asking to yourself? In a frying pan, toast the pine nuts on high heat until golden brown (about 1-2 minutes). Remove from the heat and set to the side. 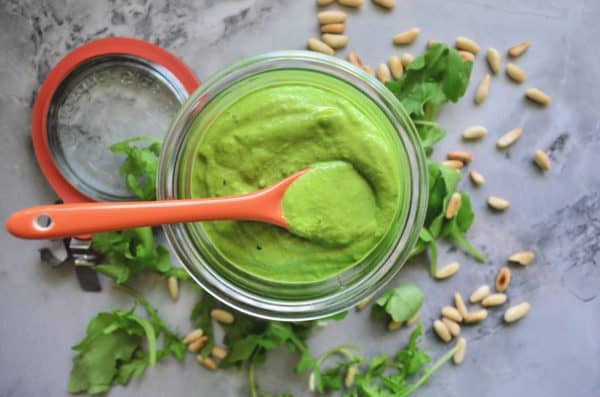 Using a high-power blender or food processor, blend together the toasted pine nuts, arugula, pecorino romano cheese, flat leaf parsley, garlic , and olive oil. As the blender is running, add in the water, Flax oil, and lemon juice. Blend for at least 1 minute or until smooth. Transfer to a glass air-tight container and store in the refrigerator for up to 1 week. Disclaimer: There are affiliate links in this post. That means, if you click on the link and purchase from it–I will make a small percentage of the sale at no additional cost to you.